The Nation reports that two small male children were found on the streets Wednesday with a bag containing their clothes in Agulu, Aniocha's local government in Anambra State. 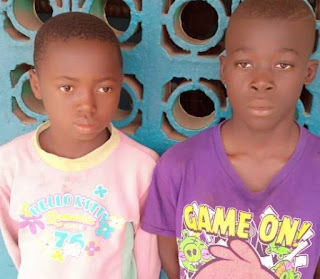 The miners, 9-year-old Chinonso Ogoh from the council area of ​​Onitsha South and Udochukwu James (11) from Umunze, were reportedly found by a group of Vigilantee who could not find the homes of their guards. State police public relations officer Haruna Mohammed confirmed that the children had been taken to the Neni Police Division by the vigilante group attached to the town of Agulu. On 8/8/2018 around 8:00 am, a self-defense group attached to the town of Agulu took Neni's division, the two children wandering with a bag containing their clothes but unable to locate the homes of their guards. ". However, he assured that efforts were made to find their biological parents in order to reunite them with the family. He said: "The command has asked members of the public for useful information that could help the children's parent to report to Neni Division or dial 07039194332."